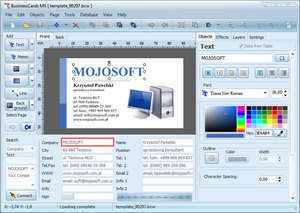 this software download will help to design and print a professional business card. the graphical user interface (GUI) of the program has been designed in such a way that even a beginning user will not have problems with using the program. The process of designing is based on inserting ready for use elements accessible in the program such as figures, images and the background, and freely shifting them on the prepared project. There are 400 examples of business cards templates . BusinessCards MX 5.0 is a shareware program and can be used as a demo to try the software until the free trial period has ended. A full version of the program is available after the trial period ends. For security reasons, you should also check out the BusinessCards MX download at LO4D.com which includes virus and malware tests. Additional screenshots of this application download may be available, too. BusinessCards MX has a presence on social networks.